NEW YORK -- Cesar Montelongo Hernandez remembers when his parents made the risky decision to overstay their migrant worker visa and keep the family in the U.S. He was just 10 years old and his sister was nine. "My family lived in Juarez in Mexico. We were very poor," he recalls. "The drug cartel was very active there and my parents feared for us." Montelongo Hernandez's life has changed dramatically since. Now 28, he's two years into an eight-year dual degree MD-Phd program at Loyola University Chicago's Stritch School of Medicine. And he's attending the program on a full scholarship. But Montelongo Hernandez now fears he could lose everything. That's because he is one of nearly 800,000 young undocumented immigrants who have sought protection from deportation under the Deferred Action for Childhood Arrivals program. The Obama-era program enables undocumented immigrants who were brought to the U.S. as children -- a group often referred to as Dreamers -- to come out from the shadows. But on Tuesday, the Trump administration announced it was putting an end to the program. Trump's order gives Congress six months to create a law protecting the people who participate in the program. "I woke up on Wednesday and realized this wasn't just a bad dream," said Montelongo Hernandez. Across the country, there are 65 DACA-protected students enrolled in medical school and just under 12 in residency programs, according to the Association of American Medical Colleges. "(They) will now face uncertainty about completing their degrees, paying their student loans, and serving patients," James Madara, chief executive officer of the American Medical Association, wrote in a letter to Congressional leaders. 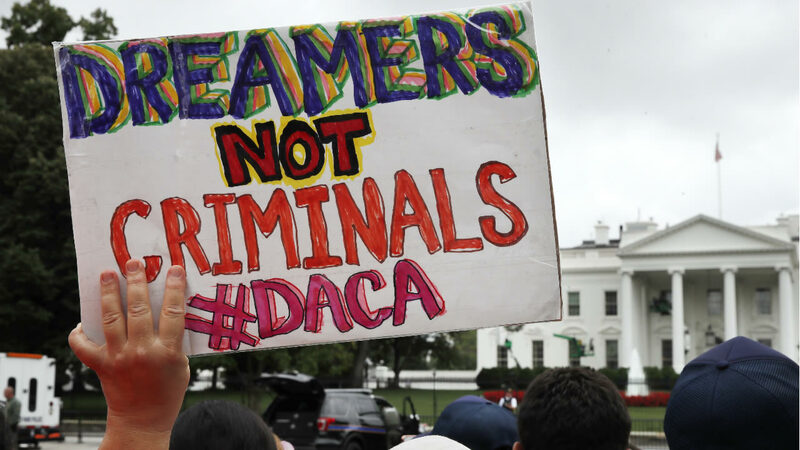 Separately, the Association of American Medical Colleges warned that ending DACA would leave these students in limbo and exacerbate the physician shortage in the United States. Montelongo Hernandez's DACA permit will expire next September. Unless Congress comes up with a permanent solution to protect Dreamers, his medical school training could be in jeopardy. "I have one year left of protection," he said. "Right now, I am pinning my hopes on Congress." His DACA status also gives him employment authorization. He needs this because the stipend he gets from Loyola, which he uses for living and other expenses, is paid as a salary. The work permit will also be critical for his clinical training and for his residency in a few years. "Once my employment authorization expires, I can't be paid," he said. Out of its 600 medical students, Loyola has 32 DACA status students and most of the them are supported by three outside loan programs. One major condition of these loans is that these students later serve as physicians in a part of Illinois that is experiencing a doctor shortage after they complete their training, said Mark G. Kuczewski, chair of the department of medical education at Loyola's Stritch School of Medicine. If DACA expires, these students will no longer qualify for the loans. "We'll have to find over $1 million in new funding to keep them in school. It would be a crisis situation," he said. Montelongo Hernandez was the first student with DACA status to be accepted into Loyola's MD-PhD program. "It felt like so much of what I had done until now had finally paid off," said Montelongo Hernandez. When he was a child, Montelongo Hernandez's parents would typically spend summers on a temporary U.S. visa employed as migrant field workers in New Mexico. After they decided to overstay their visas, his parents explained what it would mean to be undocumented in America. "I remember my dad said we were breaking rules and our lives wouldn't be normal. I understood I was giving up my freedom," he said. At first, the family lived in a trailer with 15 other people. "Later, we moved to our own trailer, but there were still 10 people with us," he said. Montelongo Hernandez attended public school. He was quiet, leading many of his teachers to think he wasn't very bright. "During recess I would just sit by myself," he said. "(I) kept to myself because I felt sad. In some ways I guess I was depressed." But after he received high marks on some exams, he was put into the school's gifted student program and things started to turn around. He graduated high school third in his class, earning a full scholarship to New Mexico State University. "My parents were pretty shocked and proud," he said. "But with their elementary education, I'm not sure they understood everything I accomplished." He applied to Loyola because it was the first university to accept DACA-status students into a medical school. He was accepted -- and again, received a full scholarship. Montelongo Hernandez has six years left in medical school. But his future is uncertain. If he's allowed to stay, he wants to finish the program, become a practicing physician and research ways to improve diagnostic tools for doctors. But he is not getting his hopes up. "I've been in this circumstance so often in my life in America," he said. "I've almost conditioned myself to get through it somehow."